Material loops are flows wherein materials or larger parts are recovered from buildings and reclaimed, recycled or biodegraded through natural or technological processes (after Sassi, 2008). To limit the life cycle burdens of the built environment, including resource depletion and waste disposal, material loops should be as efficient and effective as possible. For that reason, depending on the material characteristics and context however, waste prevention and component reuse are generally preferred over material recycling, biodegradation and heat recovery during incineration. Parallel to this material oriented perspective, other perspectives are developed. The aim in the circular economy, for example, is “to keep components circulating at the highest utility at all times” (McArthur, 2012). However, maintaining the material oriented perspective of BAMB, the related terms below are defined independent from a component’s function. Correspondingly, an alternative term for material loops’ is ‘circular material flows’. To avoid confusion, it is proposed to use the term ‘cycle’ only in relation to ‘life cycle’ as discussed in regard of the definition of ‘circular building assessment’. Several of the life cycle stages that include or foster material loops are nevertheless presented here as related terms. Waste: a building part or material that is no longer valuable and therefore eliminated. If the value of building parts and materials is maintained, it could be expected they will be part of a material loop. 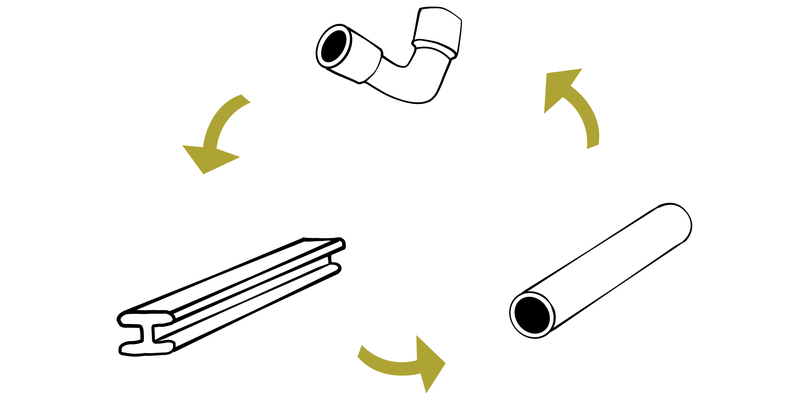 Reuse: using building parts again without remanufacturing them. Lighter processing, such as cleaning or repair, or disassembly and reconstruction might however be required to realise the materials’ loop. Recycling, up∼, down∼: using building parts’ materials again, involving their remanufacturing and resulting in an increased economic or cultural value, i.e. ‘upcycling’, or decreased value, i.e. ‘downcycling’. Remanufacturing: technically processing reclaimed building parts, e.g. by cutting and rejoining, to align them with the requirements of a different use, possibly consuming also new resources. Biodegradable, safely ∼: ability of a building part to degrade completely, wherewith the degradation by-products are fully compatible with the biological processes and environments they encounter. Biosphere: a closed system of natural processes, or ecosystems, including biological material loops, i.e. sequence of processes that components follow when biodegraded. Technosphere: a closed system of technical processes, including technical material loops, i.e. the sequence of processes that components follow when remanufactured. Replenishment (not repletion): the process of filling the material stock the biosphere and technosphere consist of; a stock available for future use during production and remanufacturing. Refurbishment: the life cycle stage returning a building to an acceptable or expected condition by replacing some of its parts while reusing others. Sassi P. (2008). Defining closed-loop material cycle construction. Building Research & Information, 36(5), 509–519.